ThriveCart offers you the ability to pause your customer’s subscriptions indefinitely or for a fixed number of rebills. This is great if you need to put a customer’s subscription on a temporary hold but not don’t want to lose their custom. Let’s take a look at pausing a subscription. The first thing you need to do is head to your transactions area and locate the transaction you want to pause. Once you’ve located the transaction you want to pause, you’ll need to click on the Manage button. 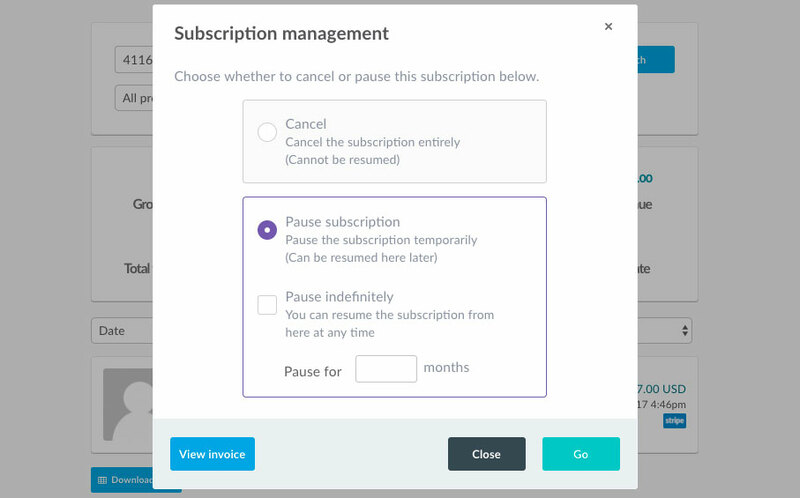 You’ll then be presented with the modal window with the choice of either cancelling your subscription entirely or, from pausing your subscription. As you’re looking at pausing your subscription. You will choose the pause subscription option. We can now choose to pause the subscription indefinitely, until such time you want to manually resume the subscription. Or you can pause for a set number of rebilling periods. So if your subscription is weekly, you can automatically pause by a number of weeks until it resumes again, the same for daily, monthly, annually, etc. When a subscription is paused, you will see that it says paused on the right-hand side of the transaction so you can clearly see if a subscription is active or not. This process is exactly the same. But instead of having the option to pause, you will be given the option to resume. Things to bear in mind when manually pausing and resuming subscriptions. Stripe doesn’t technically support the pausing and resume of a subscription, so when you resume a paused subscription with Stripe, a payment is taken immediately and their subscription then starts again from this date. PayPal is a little different in that it will resume from the next payment date the subscription was due to be paid. So if your subscription was due on the 15th of the month and you resumed the subscription on the 17th. The next payment wouldn’t be due until the following month on the 15th. Authorize.net works similar to Stripe only their transactions are processed in bulk daily. So it might not be until the following day the subscription is paused/resumed. So bear this in mind if pausing/resuming at the ‘last minute’.